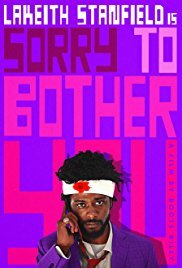 The best way I can describe a rather indescribable film like “Sorry to Bother You” is as an incredibly stylized and bizarre take on “Get Out,” ingrained in the fears and culture of an ever-evolving world and the impact that has had on the African-American community. All while its characters proudly proclaim their senses of individuality and fighting for what they believe is right and fair, yet still having a sense of humor and over-the-top style. “Sorry to Bother You” is just as funny and strange as it is trying to make about the hypocricy of the world. Set in Oakland, the film follows Cassius Green (Lakeith Stanfield) as he tries desperately to find a job in a shrinking economy. Cassius settles on a job as a telemarketer, but gets no where until a coworker (Danny Glover) suggests that he use his “white voice” so the callers won’t hang up on him immediately. Cassius sees quick success with this and feels that he has finally found his calling in life. His company notices his success and gives Cassius a promotion to a “power caller” just as his coworkers organize a strike. Now Cassius has to choose between a life of luxury and purpose or fighting alongside his girlfriend Detroit (Tessa Thompson) for what he believes in. I’ve had difficulty talking about films like this, “Get Out” and “Black Panther,” because I’m not the target audience. Which is a great thing to have being made at a time like this – we need films that speak to a wider range of people, instead of trying to please everyone. There have been plenty of relatable films for me, so let’s see what other types of stories can be told! This is even more incredible because these films are amazing pieces of cinema, from intriguing mysteries and stylized action pieces to, now, zany comedies. Even if I don’t fully understand the rational fears and sense of style in these movies, I can still appreciate and respect that it so perfectly captures and represents that style proudly. For this reason, I highly recommend “Sorry to Bother You” as it sees just how far it can tow the satire line. It is as unpredictable and crazy as it is funny and poignant. The film is proud of its style and heritage, while taking a vastly different and modern approach. If you enjoyed “Get Out,” then this film is right up the same alley while amplifying the style and comedy to the maximum setting.